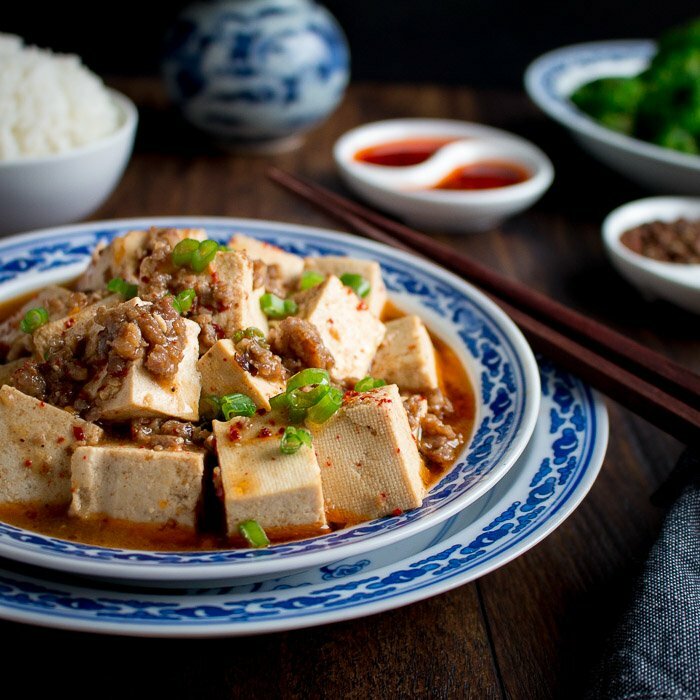 Mapo Tofu is an easy hot and spicy Sichuan Chinese recipe made with ground pork, tongue numbing Sichuan peppercorns, chili oil, garlic, fresh tofu, fermented chili bean sauce and aromatics served over a bed of rice. Easy 15 Minute Dinner Idea! Mapo Tofu (麻婆豆腐) is also sometimes called “Mapo Doufu” and is an addictive meal for the chili heads in the group! We originally posted this recipe in September of 2011. We have made it many times since then. 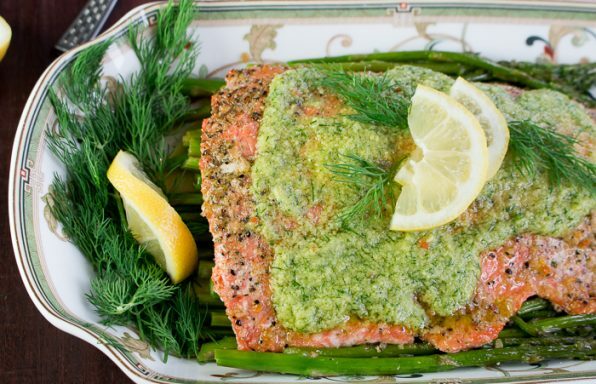 We wanted to share with you our hints for recipe success and a fresh set of photos. Those old point and shoot shots were sure to give anyone a good laugh! Do you like it hot and spicy? 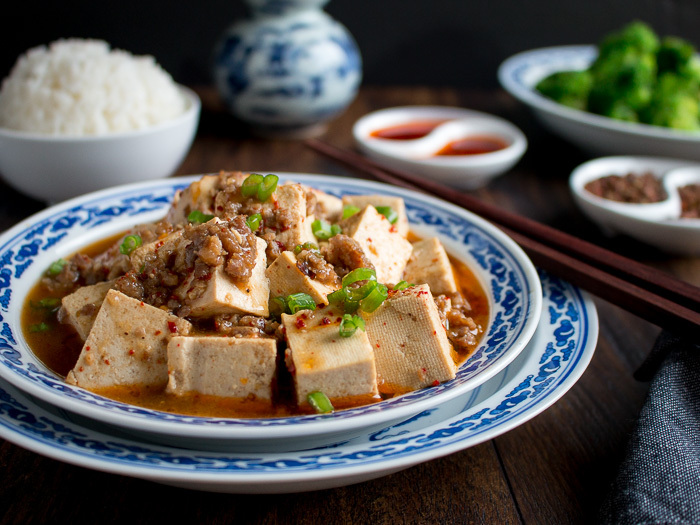 Then, you are just going to love this Authentic Mapo Tofu. You have 3 types of chili to bring depth of heat at different stages. 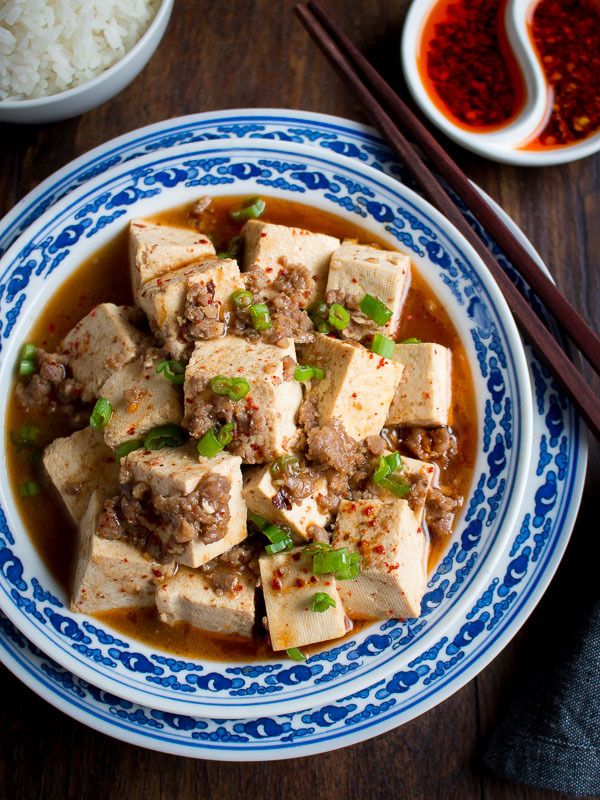 The first bite of the tender tofu and savory minced pork will have your taste buds singing. You first will taste the aromatics of the ginger, garlic and spring onion. Then, you will start to feel the heat from the fermented chili bean sauce also known as la doubanjiang. Next, you will feel the spice from the chili oil and then finally the delicious addictive tongue numbing spice of the Sichuan peppercorns. If you would like to make your own chili oil, be sure to try our Homemade Sichuan Garlic Chili Oil recipe. Do you like a good burn? Mapo Tofu is the good kind of burn that causes sweat to form on the brow. This is just what you need to warm up on these cold winter days. 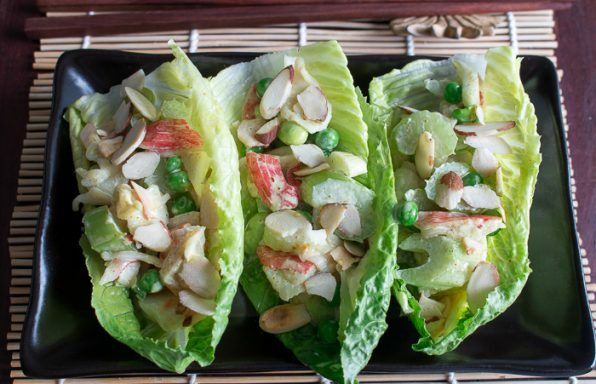 We learned how to make this special recipe from a friend living in Chengdu. 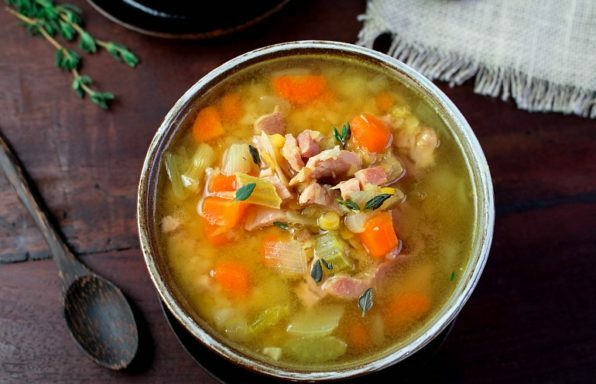 It is a rather simple recipe but the flavors are complex. 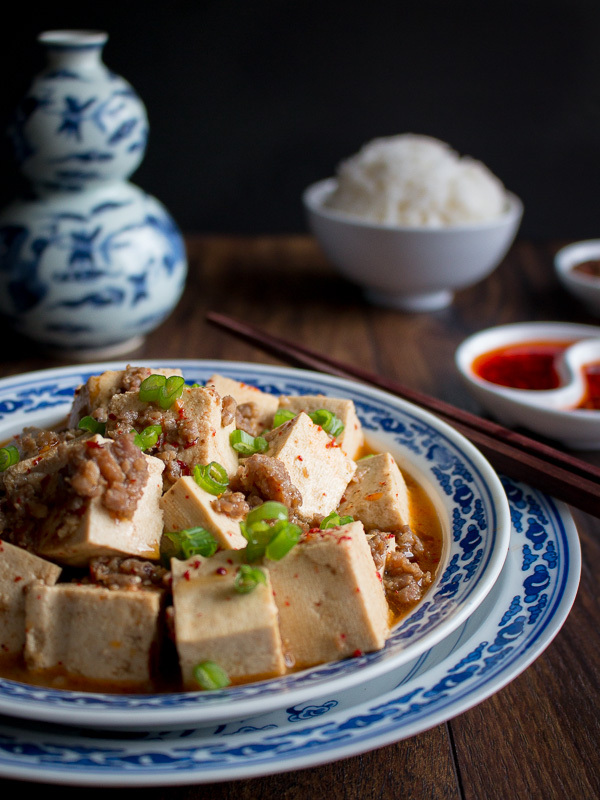 Mapo Tofu can be on your table in about 15 minutes with a side of steamed rice. 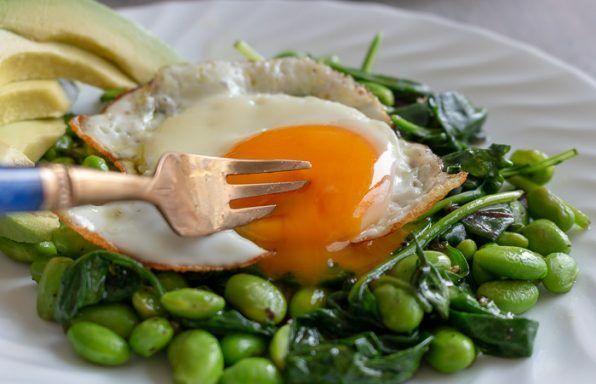 Did you know if you poach your tofu for a couple of minutes before stir frying it, it can help firm it up, freshen it up and make it extra silky in texture? That one was a new one for us as well. Your instinct is to touch the tofu as little as possible because we fear it will fall apart. However, poaching of tofu before stir frying it gives it it’s addictive texture we crave. Sichuan Peppercorns are an essential ingredient in Mapo Tofu and can also be referred to as Szechuan (Sichuan) pepper, flower pepper, flower peppercorn, hot pepper, prickly ash, hua jiao. They are not peppers or chilis but instead are the pinkish-red dried outer husks of the prickly ash shrub. 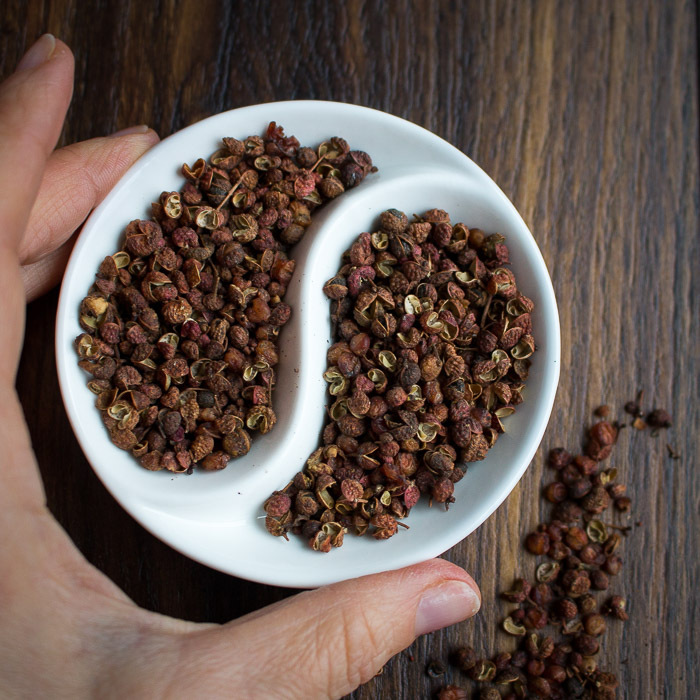 Sichuan Peppercorns are known for their powerful numbing sensation. When this spice is combined with chili it is known for reducing the heat sensation and allowing you to enjoy the fruity flavor of the chili instead. A tiny bit of sugar or sugar alternative can just mellow the heat of the dish and make it flavorful. Trip to your local Asian Food Market or Amazon! Chilli bean paste (Dou ban jiang豆瓣酱) is the main ingredient in Mapo Tofu. Doubanjiang is a spicy, salty paste made from fermented broad beans (fava beans), Chili, salt, rice, and various spices. It has an earthy and deep flavor from the fermentation. You can find Dou ban jiang in your local Asian food market and on Amazon. 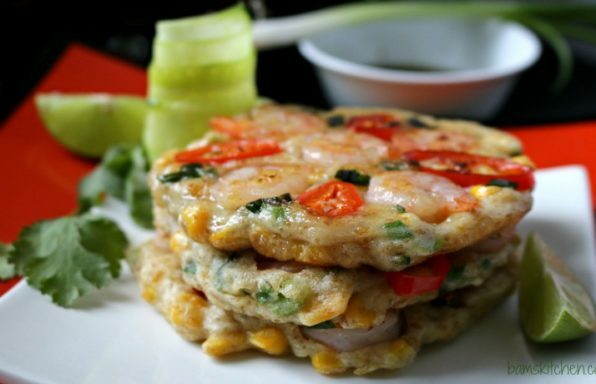 Doubanjiang is fabulous in noodles, hot pot and many other Asian recipes. What can you use as a substitute for Doubanjiang? An okay substitute if you cannot find doubanjiang is to mix a little miso paste with chili paste of choice. It is not the best but it will work in a pinch. We must bring to your attention that doubanjiang is not a gluten-free product. However if you substitute doubanjiang with a gluten free Korean Gochuang paste and a gluten-free miso paste you are good to go. What if I want to make this recipe vegan? 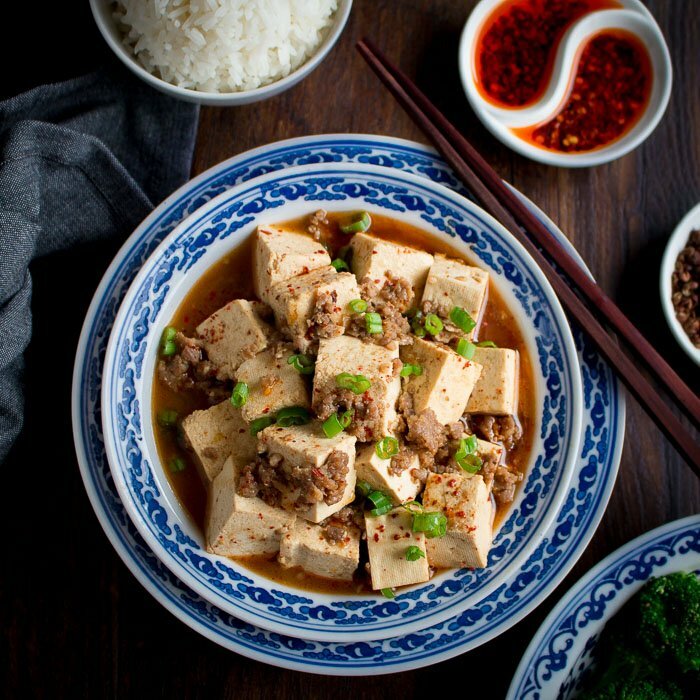 You can make your mapo tofu vegan by swapping out the ground pork with sliced mushrooms or eggplant and it is very delicious over a bed of rice. Substituting the chicken broth with a vegetable broth will also be needed. A delicious way to cool down that tongue after a spicy numbing sensation is our easy Spicy Chai Coconut Jelly Dessert which is cool to the touch but warming spices. 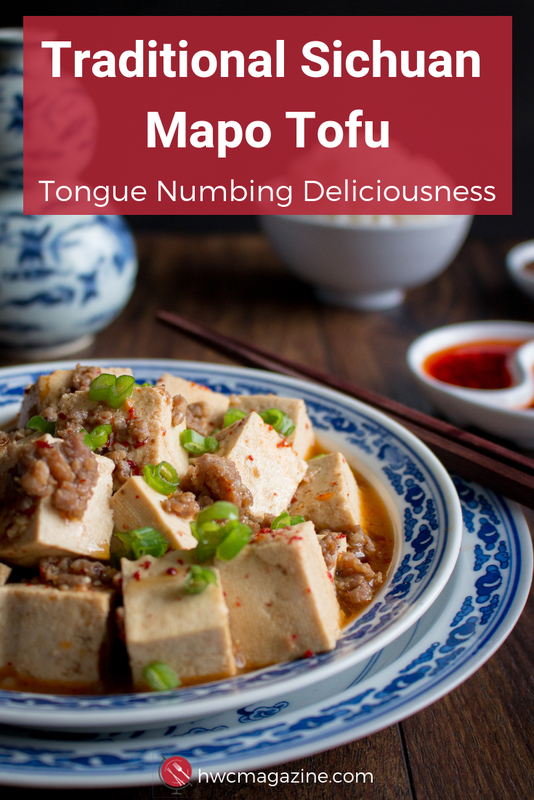 Why is this recipe called “Mapo Tofu”? Ma stands for "mazi" which means a person disfigured by pockmarks. Po translates as "old woman". Hence, Ma Po is an old woman whose face was pockmarked. It is thus sometimes translated as "Pockmarked-Face Lady's Tofu". Legend says that the pock-marked old woman (má pó) was a widow who lived in the Chinese city of Chengdu. Due to her condition, her home was placed on the outskirts of the city. By coincidence, it was near a road where traders often passed. Although the rich merchants could afford to stay within the numerous inns of the prosperous city while waiting for their goods to sell, poor farmers would stay in cheaper inns scattered along the sides of roads on the outskirts of the ancient city and would enjoy eating "Mapo Tofu". Mapo Tofu is spicy and there is no denying that. You can make this recipe as spicy or mild as you like by reducing the amount of chili oil or leaving it out. Reducing the amount of doubanjiang and Sichuan peppercorns will also change the flavor profile. 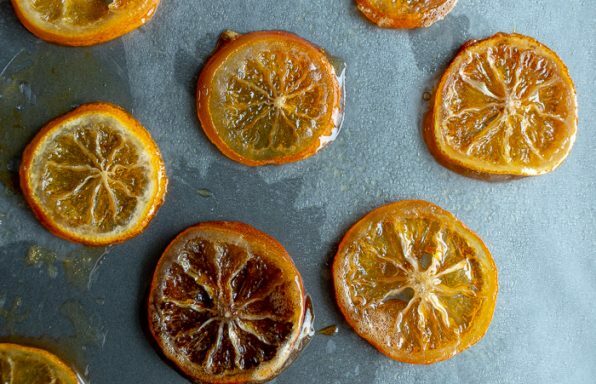 Adding just a pinch of sugar will balance the heat in this recipe. 1Bring salted water to simmer and put tofu into the water to simmer for 2-3 minutes, remove tofu and drain off carefully. Set aside. 2Heat oil in a wok/skillet over middle-high heat, cook pork, ginger, garlic and shao xing (or cooking sherry) wine until pork is browned. 3Place la doubaojiang (spicy fermented chili bean sauce), fermented black beans sauce, chili oil and ground Sichuan peppercorns in the wok with the cooked pork and cook and stir for 30 more seconds. 4Pour water or chicken broth into the wok, bring to boil. Season with sugar and salt to taste. Add the corn starch slurry to thicken the spicy sauce. 5Add in the cooked tofu and spring onions and gently toss to coat with spicy sauce. 6Garnish with a sprinkle of ground Chinese chili peppers if desired. 7Serve cooked Mapo Tofu with warm rice and enjoy! 8Chef’s notes: We like to use firm silken tofu. 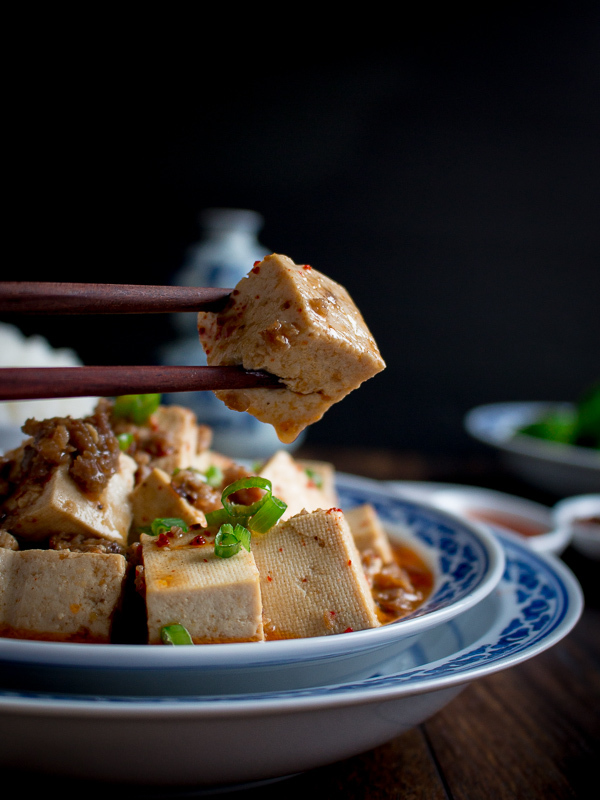 (Poaching the tofu makes the tofu texture firmer but perfectly smooth and silken) If you cannot find doubaojiang or need it to be gluten-free, substitute the doubaojiang with 1 tablespoon gluten-free miso paste and 1 tablespoon gluten free chili paste. See post above for options. Both the doubaojiang and fermented black bean sauce are already salty so check and adjust for seasoning. If you want to make this recipe vegan substitute the ground pork with either mushrooms or eggplant. You can also use ground beef, turkey, or ground chicken for this recipe.